DianeSchwobZubrick: Happy Easter and Spring! Inspiration is Everywhere! Happy Easter and Spring! Inspiration is Everywhere! I want to wish a happy spring season to everyone! This is a season of renewal - it is important to grab this opportunity to look at yourself, your life, your artwork and think how you can change things for the better. Get outside in the warmth, energize yourself and others around you! Start creating something beautiful in your artwork to share with others. Many times students will ask me where I get inspiration for my art? I always say to open your eyes and just look around! I look carefully at nature, books, magazines, fabric and fashion. 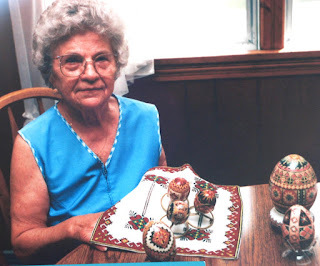 There is also such great Folk Art, the beautiful artwork done by everyday people in many cultures. I often use this art as an inspiration for my clay, glass, or gocco printing. When I was in Corning, New York last spring attending "Hot Glass Horizons", I took a walk into town to window shop. 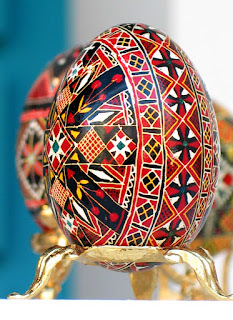 In one window was a display of Ukrainian Easter Eggs, or pysanky, by a folk artist who had passed on. I want to share them with you. I do not know the woman's name, I did take a picture of her that was on display. 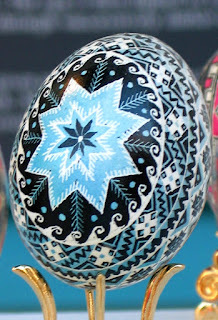 These eggs are so beautiful and intricate! 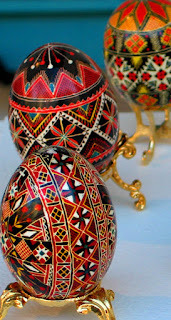 For inspiration in my own work, I would look at the colors, designs and patterns of these eggs. A small part of a pattern could be repeated for border for a gocco print on a notecard or drawn on my fused glass. So open your eyes this spring and see what you can find to inspire YOU! 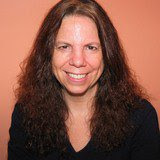 Wonderful blog and enjoyed this post. 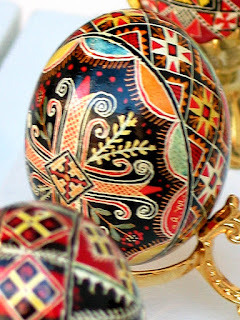 These are really pretty - very similar to Hungarian decorated eggs.